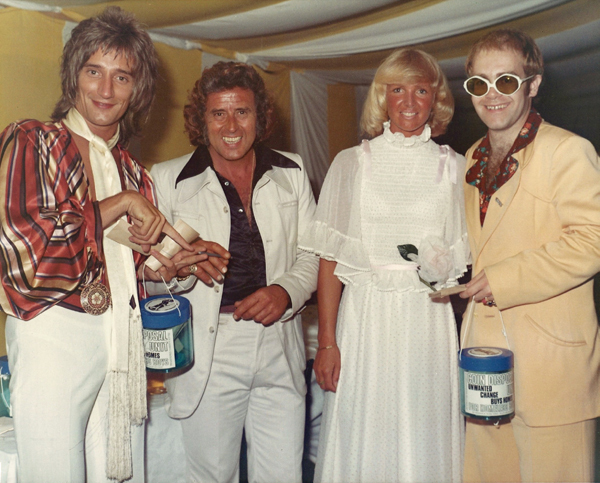 Fashion Is A Circus is a special sale of rare and iconic designer pieces, from the wardrobe of one extraordinary woman: Hannelore Smart, widow of Billy Smart Junior. Among the lots are items by Issey Miyake, Yohji Yamamoto, Thierry Mugler, Alaia and Vivienne Westwood spanning three decades. Hosted by former vogue.com editor Abi Chisman of Designer Jumble, 10% of all proceeds from this auction goes to Alzheimer’s Society. Click here to view the auction pieces at Gavel & Grand. Designer Jumble is hosting a series of amazing activities and events to mark Fashion Revolution Day, on 24th April, the first anniversary of the collapse of the Rana Plaza factory, to show shoppers how to continue to enjoy fashion in a humane way. Fashion blogger Susie Bubble will be dressing the windows on the day, to reflect current catwalk trends but using recycled fashion. Designer Katie Jones, who was showcased at London Fashion Week in Feb, will be in store upcycling a vintage Jean Paul Gaultier jumpsuit in her inimitable quirky style, and taking bookings for personal workshops. Sew It Forward is a frock-friendly initiative from The Good Wardrobe that encourages people to share their sewing, knitting and mending skills. Bring a garment in need of some TLC and find out how to keep it looking good for longer. Designer Jumble will be unveiling a collection of 1000 astonishing designer pieces from one woman’s wardrobe: Hannalore Smart, widow of Circus King Billy Smart Jr, has collected iconic items by Westwood, Alaia, YSL, Chanel, Dior and more from the last three decades, including a rare Issey Miyake moulded corset, considered one of his most iconic designs. Events will run between 10am-6pm, entry and attendance is free. Closed for private party in the evening. 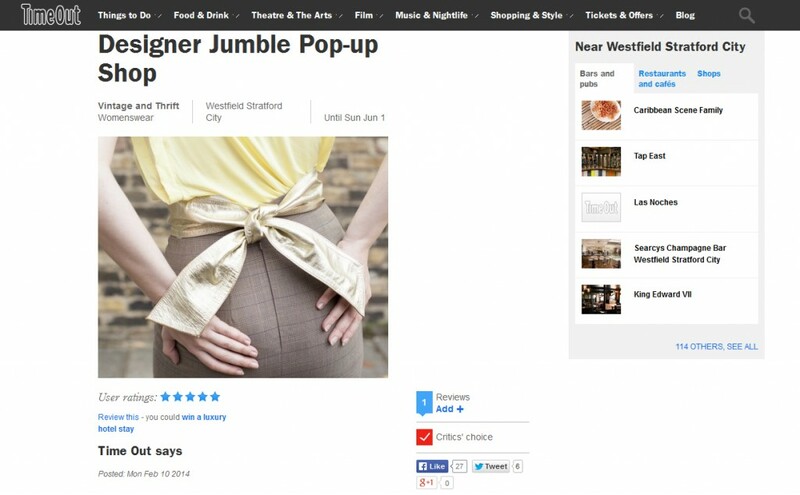 The Indytute head to Designer Jumble in Westfield, Stratford. The rails are filled with names to get the pulse racing. CHANEL, VUITTON, MARNI AND PRADA vie for attention – prices range from £10 to £2000 so there really is a piece of designer chic for everyone. Find out more over at The Indytute. 27th April – Vintage Plate Upcycling… scones included! Learn how to upcycle vintage crockery. We provide the plates and unique Indytute decals and help you to design and upcycle a one off china plate, which you can take home and display with your very special treasures. We will also be hosting a SAVE THE BEES campaign that day, so special bee designs will be available. Designer Jumble, Westfield Stratford City (find a map on our ‘Find Us’ page). No experience needed. These plates make the best presents, but they are hard to part with. There are 3 sessions so let us know what time you would like to come. Tickets are £15 and can be purchased through The Indytute by clicking here. 30th March – Jewellery-making with Kirsty of Uncommonly Beautiful to mark Mother’s Day. Uncommonly Beautiful is an anti-landfill fashion accessory label founded by the talented designer-maker, Kirsty Kirkpactrick. The 3 hour session starts with a design consultation (with Prosecco), discussing weight and structure of the necklace, taking into consideration body shape and colours. Buy what you make for an extra £20 only. Tickets are £25 and can be purchased through The Indytute by clicking here. As the founder of the Designer Jumble Sale she now runs popup shops, selling second-hand designer clothes and accessories to promote craftsmanship and sustainability to high street shoppers in empty spaces around London. Abi uses Designer Jumble to educate and inform consumers about what designer fashion really means and the true cost of the clothes we buy. A skirt by Alexa Chung’s favourite designer for just £75? If you like the sound of this then you are going to love Designer Jumble, the latest store to pop up on The Street at Westfield Stratford City. Find out more on the Pulse at Westfield.